Changing the engine oil should be performed by an Authorized Mazda Dealer. Mazda Genuine Oil is used in your Mazda vehicle and is the recommended 0W-20 lubricant. 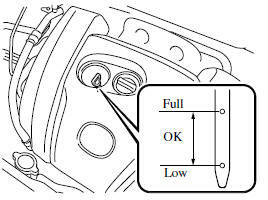 Mazda Genuine 0W-20 Oil is required to achieve optimum fuel economy. Recommended viscosity: SAE 0W-20 For maintenance service, Mazda recommends Mazda Genuine Parts and Castrol® (U.S.A. only). Only use SAE 0W-20 oil with the American Petroleum Institute (API) symbol and ILSAC GF-5. Oil with this trademark symbol conforms to the current engine and emission system protection standards and fuel economy requirements of the International Lubricant Standardization and Approval Committee (ILSAC), comprised of U.S.
Use SAE 5W-30 engine oil. Oil container labels provide important information. A chief contribution this type of oil makes to fuel economy is reducing the amount of fuel necessary to overcome engine friction. For maintenance service, Mazda recommends Mazda Genuine Parts and Castrol® (Mexico only). Use SAE 5W-30 engine oil. If SAE 5W- 30 engine oil is not available, use SAE 5W-20 engine oil. The quality designation SM, or ILSAC must be on the label. 3. Turn it off and wait at least 5 minutes for the oil to return to the oil pan. 4. Pull out the dipstick, wipe it clean, and reinsert it fully. 5. Pull it out again and examine the level. The level is normal if it is between Low and Full. If it is near or below Low, add enough oil to bring the level to Full. Do not add engine oil over Full. This may cause engine damage. 6. Make sure the O-ring on the dipstick is positioned properly before reinserting the dipstick. 7. Reinsert the dipstick fully.